1 of 4 Combine 1 cup yogurt and the dressing mix in medium-size bowl. Remove 1/2 cup to another bowl and reserve. To remaining yogurt mixture in bowl, add 1/2 cup plain yogurt and cucumber. Refrigerate until serving. 2 of 4 Heat broiler. Add ground meat to reserved 1/2 cup yogurt mixture; mix well. Divide into 6 equal portions; shape each into 3-1/2-inch patty. Place on broiler pan. 3 of 4 Broil 5 inches from heat 7 minutes on each side or until internal temperature registers 160 degrees F on instant-read thermometer. 4 of 4 Cut off top quarter of each pita; reserve for other use. 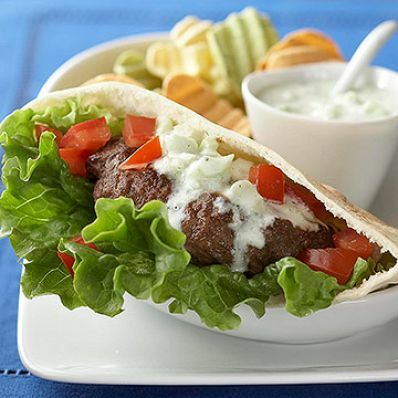 Fill each pita with lettuce, hamburger, cucumber-yogurt sauce and tomato.